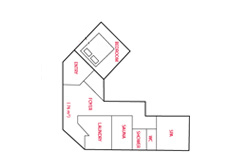 Use the form to enquire about accommodation at Perisher Salzburg Apartments. Perisher Salzberg Apartments 4 bedroom which sleeps 10 guests, located 250m from the Village 8 chairlift, with spectacular mountain views. Perisher Salzberg Apartments bedroom apartment which sleeps 8 guests, located 250m from the Village 8 chairlift, with spectacular mountain views. Spacious 2 bedroom apartment which sleeps 4 guests, located 250m from the Village 8 chairlift, with spectacular mountain views. 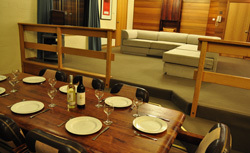 Perisher Salzburg Apartments offer the largest self contained properties available in Perisher and can comfortably accommodate ten people in the 4 bedroom apartment. Each fully self-contained apartment offers superb views of the ski slopes with either an open or enclosed balcony to relax on or perhaps you would prefer to lie in front of the open fire place! The property facilities include individual Jacuzzis/spa baths, saunas, boot room and ski room. Apartment servicing; fire places and garbage removal are carried out daily; towels are replenished after the third nights stay; a full service is carried out after the fifth nights stay. Management is situated on site and apartments are serviced daily. Babysitting and prepaid broadband service are both available on request. Deposits A deposit of 50% of the total booking price is payable within 5 days of the booking being made. Any deposit not received within 5 days may be cancelled without notice. On receipt of the deposit confirmationwill be sent. Balance Due All bookings require balances to be paid 60 days prior to arrival. Bookings for the next year will require a $100 non refundable holding deposit until the years rates are realised. Cancellation Policy Bookings cancelled more than 60 days prior to arrival date will incur a cancellation fee of 15% of total invoice value. Bookings cancelled 30-60 days prior to arrival will incur a cancellation fee of 50% of total invoice value. Bookings cancelled less than 30 days prior to arrival date will incur a cancellation fee of 100% of total invoice value. nfants/Toddlers: 0 to 4 years; additional infants/toddlers no charge Children: 5 to 14 years; additional children charged at 50% Extra Adult rate per night Adults: 15 years and over Porta Cots and High Chairs available FOC (limited availability) Oversnow transfers available on arrival and departure between 7am and 8pm Tariffs are subject to change at Management's discretion and without notice Rates are quoted in Australia dollars and are inclusive of a 10% Australian Goods and Services Tax. Visa & Mastercard with a 1.65% surcharge American Express with a 3.3% surcharge. No onsite parking at Perisher, Parking at Bullocks flat then catch Skitube to Perisher. Perisher is Australia’s most popular snow holiday destination. With seven mountain peaks, 47 lifts and 3076 Acres of ski able terrain Perisher is the largest ski resort in the southern hemisphere. Perisher offers an array of après ski options with plenty of great bars and restaurants scattered throughout the various lodges and hotels of the valley. Perisher village has shops and facilities from mini supermarkets to a newsagent, a chemist, ATMs and some great restaurants and bars. Try night skiing/boarding Tuesdays and Saturdays under lights on Front Valley using the 8 seat Express Chairlift. For something different you may want to try snow tubing. ‘Tube Town’ has groomed snow lanes allowing fun lovers of all ages a high-speed ride down the slopes & lift back to the top. Perisher has no overnight car parking. You will be required to Park your car below the snowline at Bullocks Flat (20 minutes from Jindabyne) and catch the Ski tube underground railway right up to Perisher. Most Perisher accommodations have an over-snow transport service to transfer you from the Ski tube terminal to the front door of your ski lodge. Unique to Perisher the Skitube is a short 8.5km train ride from Bullocks Flat through the Ramshead range and into the National Park then onto Perisher Valley and then another 7 minutes to Blue Cow. Bullocks flat is located 20km from Jindabyne along the Alpine Way (towards Thredbo). There’s FREE day and overnight parking at Bullocks Flat and the train station is located outside of the national park which means you are not required to carry chains in your car when travelling to Bullocks flat. Travel between Perisher and Blue Cow is free with any valid Lift Ticket however you must purchase a SkiTube ticket for travel between Bullocks Flat and Perisher Valley. These can be added on to your lift ticket at a discounted rate or you can purchase them separately if you wish to travel as a foot passenger only without a lift ticket. Perisher has terrain to suit every stranded with the added bonus of 4 resorts in one. Learn at Smiggins and progress to Mt P.
Feel the wind in your hair and slide down the slopes – no skill required! Head over to Tube Town – an exciting, low cost snow experience - you can race your mates or race your family! Located right next to the Perisher Valley car park, within walking distance to cafes, restaurants, restrooms AND tobogganing… there’s enough here for you to never have to leave Front Valley. You don’t even need to climb back up the hill, just put your feet up and be towed. Our breathtaking mountain views aren’t only for skiers and boarders. The Perisher Quad Express is a great way to experience the incredible vistas across the Snowy Mountains from a lofty height of 2000 metres above sea-level. Take the opportunity to get off at mid-station and warm up with refreshments before riding all the way to the top. Don’t forget the camera (and a scarf!). Want to relive your childhood toboggan memories? Or create new ones? Head to Perisher Valley for the largest toboggan area in Australia. Slide down the hill, build a snowman, and if you want to take a break it’s only a short walk to cafes, shops and restrooms. Explore more of the picturesque Snowy Mountains and go on a cross-country skiing adventure. Perisher boasts over 100km of marked cross-country trails perfect for a peaceful walk, glide or a heart pumping workout. After an active day on the slopes, relax and share your day’s adventures in one of the many apres-ski options in Perisher. Enjoy a romantic candlelight dinner, a fireside chat in an intimate lounge, a refreshing beverage in one of the village bars, or dance the night away in a high energy nightclub, Perisher has something for everyone. Tuesday is Perisher's night of lights! Don't miss Perisher's fantastic fireworks display from 7:20pm - it's free for all to see! Every Tuesday, in conjunction with night skiing & snowboarding (weather permitting). Try night skiing and snowboarding under the stars! Open from 6:00pm to 9:00pm the Village 8 Express chairlift will speed you to the top of Front Valley. You can have more fun while you squeeze in more runs, plus, freestylers can take on the PlayStation Slopestyle Park under lights too! A safe and fun-packed night out for the little ones on Zoe's ski carpet, from 6:00pm to 8:00pm, and from 8:00pm a fireworks spectacular not to be missed! Perisher and the surrounding high country provides a wonderful playground for skiers, snowboarders and nature lovers. As time moves on, it is easy to forget the good old days of rope tows or no tows, lodge buildings, homemade skis, lace up leather boots and riotous lodge parties. The Perisher Historical Society (PHS) has been established to capture the memories of the early days of the Perisher Range area. ‘It has been claimed that the Perisher Valley was named by James Spencer, who had settled in the area in the 1840s, when he was caught in a storm. His comment 'What a perisher' is probably apocryphal but it is a reasonable account of both the weather and the location. The Perisher Range means those areas within the Kosciuszko National Park associated with the access provided by Kosciuszko Road including but not restricted to the centres of Blue Cow, Guthega, Perisher Valley, Smiggin Holes, and Charlotte Pass.